St Mary’s remains one of the most over-subscribed schools in the North East. Building on the momentum of its increasing sixth form enrollment, the school needed a new facility that would provide an exclusive area for the students to both study and socialise. The school appointed Ward Robinson architects. Their solution involved the opening up of a series of existing classrooms and offices to allow for a social study hub and café breakout area, as well as a silent study room and learning resource centre. Built in facilities include a student managed café, bleacher seating, integrated technology and a range of both group and individual workstations. The materials and colours were carefully considered across the range of settings to create a light and airy environment, as well as to incorporate the school’s colours through the furniture and accessories. 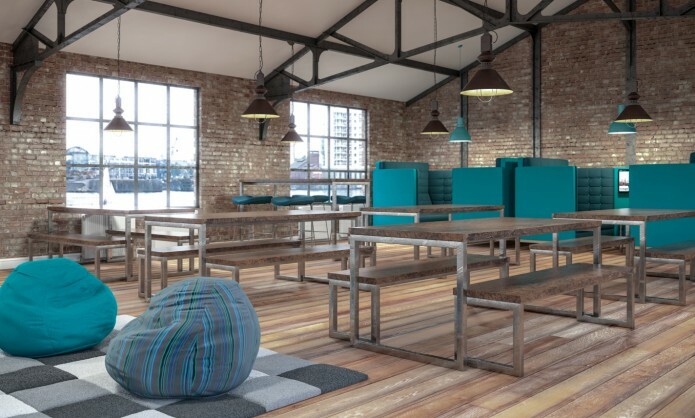 Furniture included products from Verco, Sixteen3, Frovi and naughtone. Check out some of our other education projects here. 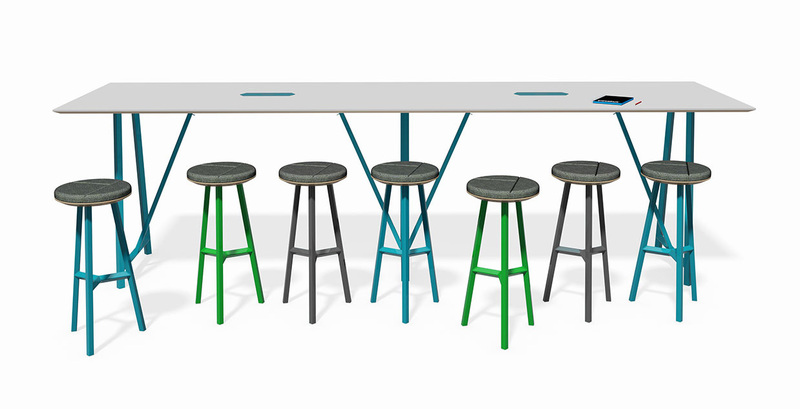 Introduced at Clerkenwell Design Week, Relic is the latest bench product from Cotswold’s based manufacturer Frovi. 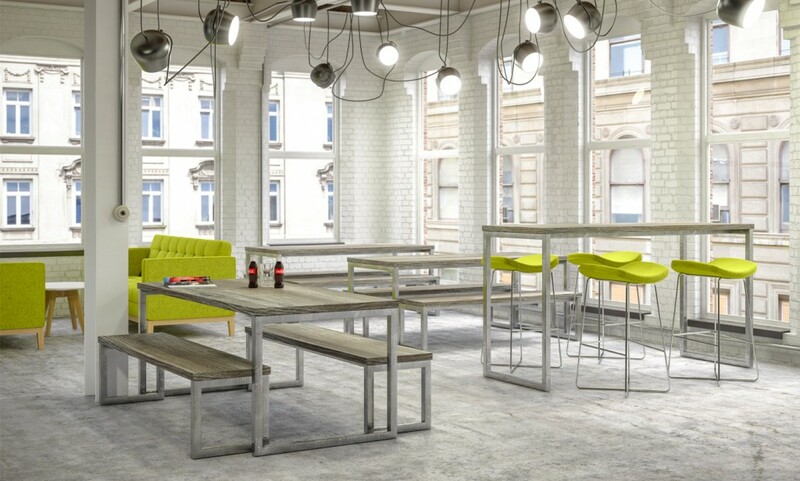 Like Frovi’s previous bench product, Block, Relic is modular and available as dining height or poseur height. 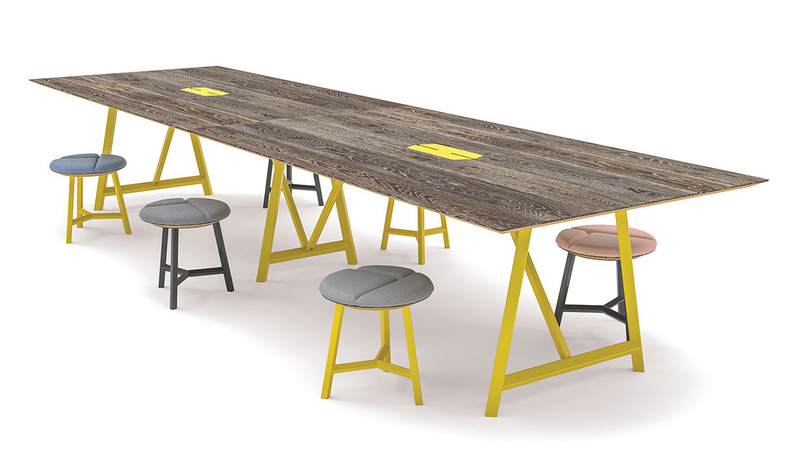 As the name implies the product apes the rustic look of a trestle table and with the option of character driven finishes. The inset trestle understructure features invisible cable management and telescopic beams allowing lengths from 1400mm to an impressive 6000mm. Power and data ports are available as an option on all table sizes. Relic is available in 11 modular sizes from 1400x800mm up to 6000x1200mm and 750mm or 1050mm high. A standard height wide version offers two further sizes: 3200x1600mm and 3600x1600mm. Circular and rectangular upholstered stools complete the Relic range, with stitching details echoing the trestle leg shape. Frames are available in a range of 23 RAL colours including Raw Steel. Tops are available as ‘Cutline’ laminate or ‘Cutline’ Fenix – providing a clean thin-cut tapered edge in a wide variety of colours or as ‘Sawn’ with a solid oak top layer bonded to a ply core with an extreme chamfered edge detail. If you’ve been looking for home furniture recently you may have noticed the current trend for the reclaimed rustic or industrial style where curved aluminium, rivets, cast iron and aged wood is the order of the day. Whilst this trend is certainly breaking into the commercial sector in terms of bespoke joinery items will it find its way into mass produced furniture? 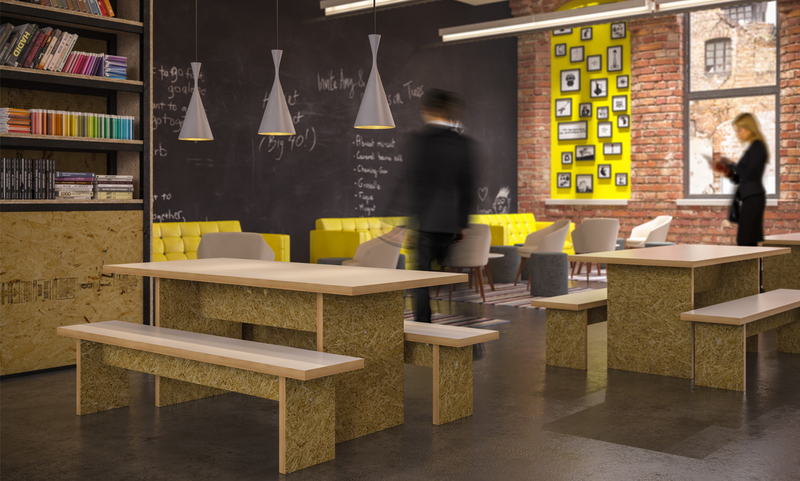 Frövi certainly think so and have expanded their Block bench table range to include the Steel Rustic and Classic_Raw. Block Steel Rustic features the same size options and steel loop frames as Block Steel but here in raw steel. Weathered tops complete the look with a choice of Drift Wood, Vintage Oak or Rust effects. The Block Classic is a variation on the Block range, here featuring inset panel supports with over-sailing tops. Classic_Raw utilises OSB board as a structure finished with contrasting ply-effect edges and white laminate top surfaces.